K.O.I. 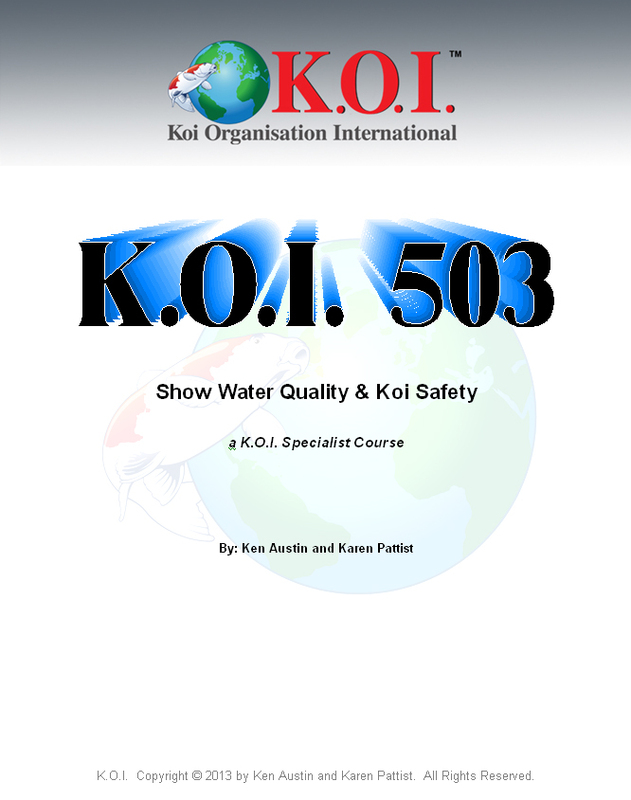 Show Water Quality and Koi Safety | K.O.I. Understand requirements for pre-show preparation. Understand all aspects of Koi Show health issues, and learn the tasks required for preventing disasters and keeping Koi healthy in tanks. Understand the dynamics and the responsibilities of the Show Water Quality team. Review proper transport techniques, and understand how to treat emergencies and injuries of Koi. Be able to diagnose and treat short term health issues of Koi held in tanks. Understand why and how to properly control water quality through good record keeping and the use of chemicals. Review the proper water quality testing required for holding Koi in tanks and understand how those test results are used to maintain proper chemical levels in the tanks. Understand why and how to set up a proper bio-security plan for the show arena, and issues involved in tank set-up, tear-down and proper disposal of used tank water. Understand how to properly disinfect tools, tubs, and nets used for the show. This course is open to any Koi Keeper that wants to learn more about how a Koi Show handles all the Koi and maintains perfect water quality throughout the Show. This is an intermediate level course that is part of the K.O.I. Show Water Quality Specialist Certification, but may be taken as a stand-alone course. Some math will be required. Learning how to properly handle Koi and maintain water quality at a Koi Show is something that may be of interest to every Koi keeper, even though they may never show their Koi. Excellent water quality is maintained through the use of chemicals (rather than filters) at a Koi show, and the techniques and practices involved are ideal for whenever Koi require short term (less than a month) quarantine. Proper netting and bowling whenever Koi need to be handled is key to reducing stress in Koi, which can lead to sickness and even death. Learning to diagnose and treat issues occurring during transport may be of use to every Koi keeper that purchases fish and brings them home. The Show Water Quality and Koi Safety Course is designed to present a method of preparation for Koi shows, maintaining water quality during a show, and finally disposal of show water once the show activities are complete. This is a self-paced course. There will be an exam at the end of each assignment. The exams can be taken at any time - just email to the instructor a request for the exam to and it will be sent to you. Questions can be emailed to the instructor. If a student requests that certain information be kept confidential, then it will be re-phrased and presented it to the class, if pertinent, but will respect the anonymity of the student. Have some fun with this. Managing water quality and Koi safety at a Koi show can be a difficult task, so the instructor encourages each student to both learn and enjoy the course. Everyone who works hard is expected to complete the course. To complete this course, students must provide satisfactory answers on all exams within 12 months of the first instructor contact. Students will be given every reasonable opportunity to understand the answers to the quiz and exam questions. Students will be prompted for a more complete answer if their first attempt is insufficient. A score of 100% will be required to pass this course.